Initial construction is an intense and exciting time, but happens only once in the history of the observatory. Aside from providing an interesting photo album, the principal value of documenting the construction here is to share the experience with others who have built or may be planning to build an observatory. Perhaps my experience can provide some ideas, or just identify problems to be avoided. 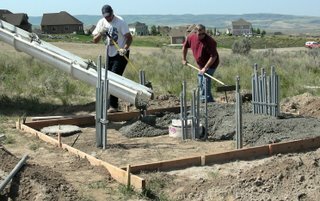 For the concrete and electrical work, I relied on our favorite general contractor, John Blumhorst Construction of Idaho Falls. John has done other projects for us, before and since the observatory, and we have always been delighted with his work. He also provided valuable advice and support throughout the project. 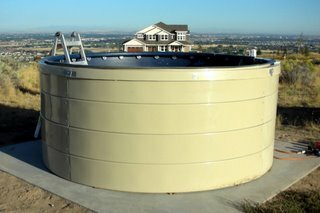 The foundation for the telescope pier must be isolated from the observatory floor and foundation. If there is any connection, even minor disturbances on the observatory floor will be carried to the telescope and cause noticable shaking of the image. In addition, at least at my type of site, the foundation should be poured directly into undisturbed earth. For my first pier foundation at the observing pad, I stopped my contractor as he was about to excavate and install a Sonotube for the full depth of the pier. This would have been fine for an ordinary building foundation. But it would have been virtually impossible to backfill around the foundation solidly enough to prevent shifting and vibration. LeSueur Manufacturing provided a mounting kit and detailed instructions for the foundation to be used for their Astro Pier. I used a post hole shovel to excavate for the foundation, and made the hole a bit oversized. The ultimate depth was 54 inches and the diameter near the bottom was about 24 inches. The weight of the concrete is a major contributor to the stability of the pier, and I estimate that the volume of the foundation accommodates about 1/2 ton of concrete. There is no need for reinforcing bars in the concrete. The foundation extends only about 6 inches above ground, and I used a short Sonotube segment as the form for that portion. None of our local big box hardware stores carries concrete form tubes larger than about 12 inches. However, I found an local industrial supplier that carries large diameter forms. The 10-inch segment I wanted was way below the level of their minimum order, but they were happy to cut me a piece at no charge from the scrap cutoffs that they keep around. The bolt circle for the pier needs to be aligned with one bolt oriented within a couple of degrees of true North. On a clear night before the concrete was poured, I set up my Celestron Nexstar 5 (computerized goto) telescope several yards south of the pier, aligned it carefully, and established a landmark at true North. Conveniently, the best landmark turned out to be a distant neighbor's illuminated porch light button. I left the telescope set up. The next day I used the scope to confirm the landmark and then drove in surveying pins on the meridian line just north and south of the pier. A string between these pins provided the reference line for aligning the bolts. I also ruled a line on the flake-board templates for the bolts, to simplify alignment when I sank the J-bolts into the concrete. Although the pier alignment is unimportant for the present altazimuth mount, it will be significant if I later install an equatorial mount. 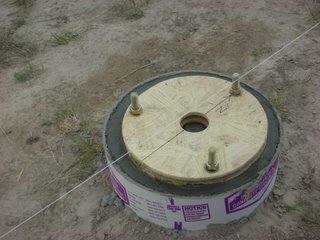 I had used a similar alignment method for the observing pad pier, and the alignment turned out to be accurate within about a degree. The tolerance for the alignment is about 5 degrees in either direction, so there should be no problem. I knew in advance that the concrete delivery for the pier foundation would be a bit oversized, so I dug three smaller extra holes around the pier foundation but within the observatory foundation area. The excess concrete filled these holes nicely, and I embedded bolts in the resulting footpads to tie them to the observatory foundation when it was poured later. These extra footpads add to the mass of the observatory foundation and might resist any tendency of the foundation to drift down the slope and put stress on the pier foundation. 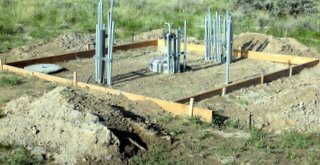 Before the observatory foundation was poured, the conduits had to be installed for the electrical and information services. This was a day-long project. My plans for ample information services resulted in a remarkable number of conduits sticking up within the forms. Although I had measured carefully to place the conduit clusters just inside the ultimate wall positions, it didn't look like there would be any space to move inside the completed building. Fortunately, my measurements were correct and there is ample maneuvering space inside the finished building. 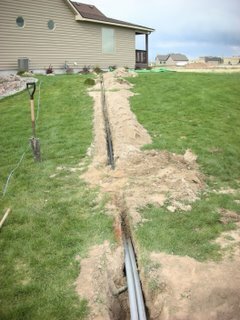 Installation of the cables into the conduits would wait until the building was assembled and closed up. I sized the foundation at 12x12 feet, providing at least a foot of margin all around the observatory wall. The foundation is oriented with the sides at cardinal compass directions. Since the observatory door is oriented to the northeast, that corner of the square pad makes a nice porch in front of the door. The pier foundation was allowed to cure for at least two weeks before the observatory foundation was poured. Pouring and finishing the concrete is a major event, but only takes part of a morning. I left the Sonotube form in place around the pier foundation to ensure a gap remains between the pier foundation and the surrounding concrete pad. In the dry Idaho climate, the cardboard may well last for decades. If and when the cardboard erodes away, I will fill the resulting gap with a suitable sealant. Although I didn't plan it that way, the concrete finishing resulted in a slightly lower surface in the northeast corner. This turned out to be very convenient, since it provided a clear sweep area for the door. I just wish I'd thought of it ahead of time. While the concrete pad was curing, the observatory was resting in its shipping crate in a garage bay. It was time to start the preassembly. Before I selected the PD-10, I carefully looked over an installation of the same size and height and concluded that I could do the assembly. 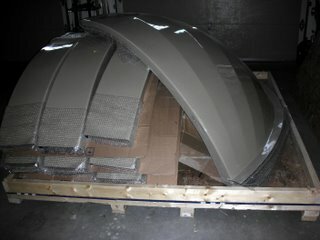 Technical Innovations offers an option for preassembly of the observatory parts at their facility before it is shipped. I did not order preassembly, since I was convinced that I could do the assembly and didn't see the point of the extra expenditure. In retrospect, I would have been wise to go for the preassembly. It would saved me quite a bit of time and frustration. I preassembled each of the four wall rings in an empty garage bay. Assembly involves lining up the various fiberglass parts and drilling holes for the dozens of stainless steel bolts that tie them together. Drilling fiberglass is unpleasant. It generates dust that irritates eyes and skin. Safety glasses and gloves are a must; long sleeves are a good idea, but not comfortable in hot weather. In addition, the fiberglass wears down drill bits quickly. I vacuumed up the fiberglass dust frequently to keep it from spreading. Ordinary drill bits tend to crack the gel coat, and some precautions are needed to prevent leaving ugly chip marks on the finish. I found that starting with a 1/8 inch pilot hole and finishing with a brad point drill bit virtually eliminated any damage to the gel coat. Most of the required holes are 9/32 or 5/16 inch diameter. Each of the four wall rings is made up of five segments (plus a door segment). Segments for a wall ring are joined end-to-end using two bolts per joint. In addition, each wall ring is joined to the one below it (or the foundation) with 13 bolts. When preassembly of the four door segments is included, this adds up to about 227 holes to be drilled, just for wall assembly. 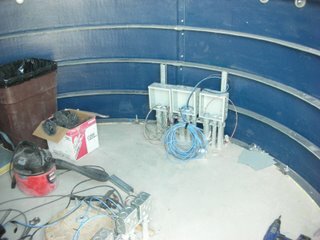 Additional holes are required for the foundation bolts and each of the rollers that support the dome. I carried the (carefully labeled) wall segments out to the foundation and reassembled them, carefully circularizing each ring before bolting it to the one below it. This is where the real problems began. The fiberglass wall rings don't really want to be circular. They are apparently not perfect arcs when they come off the mold, and each ring segment tends toward its own as-formed shape. Nevertheless, in a few days I had built up all four rings with the top ring circular to well within the tolerance called out in the instructions. All that remained was to level the top surface and bolt the wall assembly to the foundation. Long after the fact, I think the correct procedure would have been to both level and circularize the walls in one build, and then install the foundation bolts with as little disruption as possible to the walls. Instead, what I did was to mark the locations for the foundation bolts, partially disassemble the wall rings to get them out of the way, and then install the foundation bolts at the marked locations. Drilling for the foundation bolts was a frustrating task. A few of the 13 required holes drilled out nicely, but others just wouldn't drill. I tried several impact drills, and several types of masonry bit, and still have the broken and worn-out bits to attest to the toughness of the concrete. When I asked the builder what I was doing wrong, he revealed that he had poured 6000-lb. concrete for the pad. He agreed to drill out the remaining holes. It wasn't easy for him either, but they were done in a day. So I installed the foundation bolts and reassembled the wall rings, with shims installed around each foundation bolt under the bottom ring to level the top. Although I bolted them together in exactly the same way as before, the reassembled walls were over two inches out of round. In several attempts, I couldn't persuade them to go back to the circular shape. This is where I started asking for help. 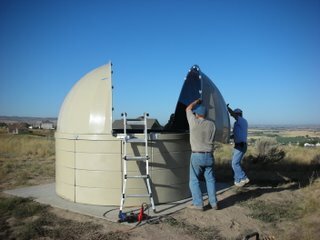 I spoke with several individuals who had assembled this type of observatory, and got several stories on how to get the walls into the correct shape. No two stories were alike, and none matched the instructions that came with the observatory! There were several interruptions during this phase of the work, for trips, vacations, family reunion, and so on, and summer was expiring with no observatory. Also, the as-yet unused parts and the dome preassembly were taking up two garage stalls that we would need to clear out before the snow flew -- not far off in Idaho. I decided on my own new strategy for putting up the walls. I bought a few dozen small C-clamps at the local discount house, and reassembled the wall rings using the C-clamps instead of bolts to attach each ring to the one under it. This allowed me to make minor adjustments to the ring stack and get the walls aligned before bolting them together. I also pre-drilled new holes in the bottom flange of each ring. The mating holes in the rings below would be determined after the alignment. To measure the circularization, I built a 10-foot caliper from poplar, with markings 1/4 inch apart on both sides of the nominal 119-inch outside diameter of the walls. This made the measurement much easier than the tape measure approach I had used up until then. One more important change was to install braces on the inside of the walls on each side of the door. The braces form a triangle between each wall segment and the concrete pad, keeping the walls vertical at those points. These wall segments had tended to be a bit wobbly, even with the door clamped between them, making it hard to measure the circularization at these points. Once these segments were firmly supported, I used them as a starting point for circularization. I also decided I needed some capable help. So I called on a friend and accomplished handyman, Bruce Boren. Bruce gave up a week of evenings to come up and help me rebuild the walls. We set up a laser surveying instrument over the pier foundation to measure the height of the wall rings. This is much faster and more accurate than the bubble levels and water levels I had used earlier. For leveling, we determined which foundation bolt was under the highest point on the wall, and installed shims under the base ring at each bolt location progressively outward from there. The thickest shims were about 3/4-inch, under the wall segments on each side of the door. As I mentioned above, the concrete foundation is slightly low in that corner, and the low point provides a convenient sweep area for the door. We had to enlarge several of the holes in the base ring to accommodate repositioning the wall segments over the foundation bolts. This was the most time-consuming part of the work, since each base ring segment had to be removed in order to work on the bolt hole. This time the rest of the walls were left bolted and clamped in place while we made the adjustment. We rechecked the walls for circular and level after each foundation bolt was tightened. Minor adjustments to the other wall segments and clamped joints were necessary as we worked our way around the wall. Finally, on the fourth evening, we had everything within specification again, with all of the foundation bolts snug. With the C-clamps still in place, we re-drilled and bolted each wall ring to the one below it; again measuring the result from time to time. With all the bolts installed and clamps removed, the walls were ready to receive the dome. The wall braces on each door stub remain permanently in place. 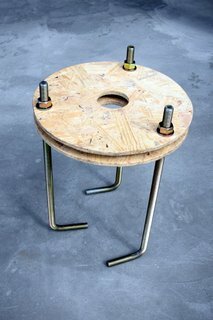 It's essential to preassemble the dome, since the bolts and some components are difficult to reach with the dome in place on the wall rings. The main part of the dome comprises four quadrants that bolt together into two roughly hemispherical dome halves. The dome halves are joined at the back by the rear shutter segment, 36 inches wide. The remainder of the 36-inch gap between the dome halves remains open, and forms the shutter opening. Wooden braces maintain the correct gap in the shutter opening during preassembly and final installation of the dome. 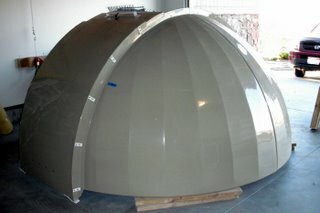 During the preassembly the dome parts are fitted and bolted together. The remaining shutter segments (top and front) are also fitted, but not bolted. They slide freely over the shutter opening and nest over the stationary rear segment when the shutter is fully open. In addition, the heavy shutter windlass and pulleys are installed on the rear shutter segment, and 14 pulley assemblies are mounted on the dome halves to guide the cables that operate the shutter. Latches and pulley assemblies are also installed on the front and top shutter segments. 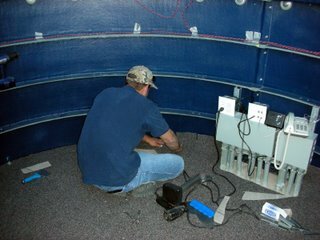 The dome preassembly went smoothly, and by the time the wall rings were finally assembled and correctly aligned, the dome was also ready for installation. Lifting the dome halves onto the walls requires extra hands and no wind, since the dome halves are heavy but excellent sails. We had to wait for a weekend morning with no wind. The first Saturday in September was perfect, and two families and a helper gathered for the dome-raising. The narrow dome support ring (DSR) was already preassembled onto the rollers, and temporarily shimmed to space its outer flange uniformly from the already-circular walls. The next step was to lift the two dome halves into place and bolt them back together with the rear shutter and the wooden spacers. This went quickly, and the only remaining step was to bolt the dome to the DSR. This is another crucial step. Until they are bolted together, neither the dome nor the DSR has the rigidity to hold a circular shape. If this assembly step does not align them correctly, the DSR and bottom of the dome will be out of round, and will bind on the observatory walls during rotation. With the dome and DSR in place, the only access for drilling holes and installing the bolts that bind them into a unit is an access port thoughtfully provided under the flange of the top wall segment. The dome/DSR assembly, temporarily secured with duct tape, had to be rotated to and fro to put each bolt position over the access port, until all of the bolts were installed. With all bolts installed, we tentatively gave the dome its first turn. It rotated freely with no binding. The front and top shutter segments were quickly installed, and the shutter, although a bit heavy, also operated freely. We had an observatory building. It had turned out great, and a brief celebration was in order. With the observatory building in place, the next step was installation of the electrical and information services. It took the better part of two days to run all of the wiring and install the connectors. By the end of the second day, I had electrical service in the observatory. I was able to install the remaining observatory components without assistance. A priority was to install the electric shuttter drive. Although the shutter can be opened and closed manually, it is difficult. Either a stepladder or a long pole is required to pull it over the peak of the dome, and considerable force is needed to lift the shutters up the steep sides of the opening. I don't consider it practical to operate the shutter manually. I had installed the motor and windlass for the electric shutter driver on the rear shutter segment before assembling the dome. After the dome was in place, I installed the largest remaining components, a 12V power supply and the Digital Dome Works (DDW) controller box, just conterclockwise (north) of the door. Drive power from the controller gets to the motor assembly on the dome by means of a pair of sliding contacts on the dome, which engage a pair of pads on the top of the dome wall when the dome is in the home position. Permanent magnets and reed switches are mounted on the shutter segments and dome to allow the DDW controller to sense when the shutter is fully open and fully closed. An additional sensor set detects when the DSR swingout, which allows the door to open, is shut. This sensor is used by an interlock that prevents dome rotation when the swingout is open. A cleverly designed relay box mounted on the rear shutter makes use of the limit switches to stop the drive motor when the shutter reaches a limit, and convey through the two movable contacts the status of the DSR swingout and whether the dome is in the home position. When all of the shutter system components were installed, I made the appropriate connections using the wires provided with the electric shutter drive kit. Finally, I threaded the two drive cables from the windlass through the pulley system. The shutter drive worked perfectly on the first try. The power supply and DDW controller serve both the shutter and dome rotation drives. Only three more components are needed to implement the electric dome rotation. Two motor drive units are installed about 180 degrees apart on the top wall ring, and an azimuth sensing wheel is positioned under the DSR near the north drive motor. Openings are precut in the top wall segment for the drive rollers and the azimuth wheel. It only took a couple of hours to complete the installation and wiring. Like the shutter, the dome drive worked perfectly on the first try. It was important to caulk all of the wall and dome joints before the next rainfall, since any moisture caught in the joints is almost impossible to clear out. It took about two days to work my way around all of the gaps. Once it is in place, the clear caulking compound blends nicely with the tan dome finish and is nearly invisible. The gaps of up to an inch between the dome wall and the concrete pad were filled with low expansion foam to eliminate the void space and help stabilize the walls. The inside edges of the gaps were the then sealed with clear caulking compound, and the outside edges were sealed with tan caulking compound. I chose a durable weatherproof caulking compound for these gaps. I heated the caulking tubes thoroughly with a hair dryer to help the compound flow into place. After years of exposure to the Idaho elements, the caulking is still in good shape. The ProDome is a quality product. The finished observatory is rock solid, and everything -- the dome, shutter, and door, works as it should. All of the parts are well built and seem to be thoughtfully designed. It's also an attractive building. The assembly demands a deliberate approach and attention to detail. It put my limited experience with such projects to the test. It also took much longer than I had planned -- largely due to the difficulties with wall alignment, but also because of the need to work through a great many details. But the final result was about as I expected. I was disappointed that the assembly instructions in the manual were sometimes unclear and even misleading. In each case, a phone call to Jerry Smith at Technical Innovations (TI) cleared things up. I have been very impressed with the support from Jerry -- before, during, and after the installation. As of November, 2008, TI has put up a new web site that includes more detailed descriptions, and extensive photographs of the assembly process. The new information should be very helpful to anyone assembling their own observatory. If I could start over on this observatory, I would opt for the preassembly at TI. If I were to build a second observatory, and had the time, I would not hesitate to do the assembly myself, since I think I have learned the details and pitfalls of assembly. I certainly recommend the caliper and transit approach to aligning the walls. The use of C-clamps during alignment is probably not necessary, if the wall rings are leveled concurrently with circularization; however, they do no harm and provide some margin for misalignment on the initial stacking.